Angloco Support for Colleagues of Fallen Firefighter Steve Hunt at the 2013 New York Marathon! Five firefighters from Greater Manchester Fire and Rescue Service ran the world’s most popular marathon in New York on 3rd November 2013 in aid of their fallen colleague FF Steve Hunt and the Fire Service Charity Operation Florian. Angloco’s £500 donation has contributed towards the £20k target to support the Steve Hunt memorial fund and Operation Florian and also helped to provide much needed sponsorship for all the runner’s tops. 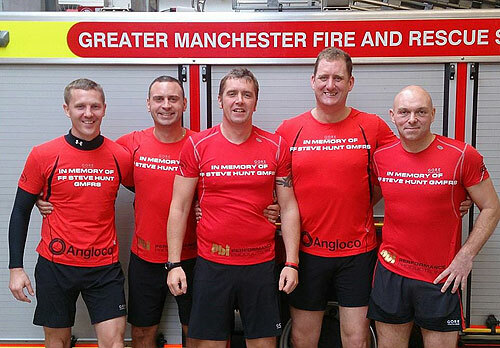 Firefighters, Pete Griffiths, Rob McDonagh, Leon Dally, Mark Haslam and Dean Hanley showed their respect for their fallen colleague with ‘Running for Steve’ on the Angloco sponsored running shirts. Pete, Rob and Leon have run the marathon before but it was a completely new experience and challenge for newcomers Mark and Dean. Operation Florian promotes the safety of firefighters and their communities by providing equipment and training to save lives worldwide. The charity has over 200 volunteers, mostly from the North West.